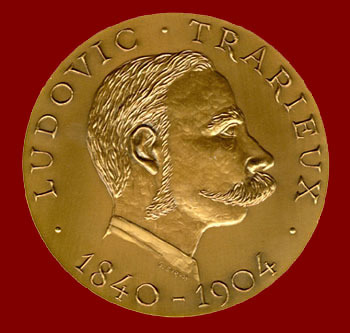 The "Ludovic-Trarieux" Human Rights Prize 2019. "The International tribute from Lawyers to a Lawyer"
Since 1984, the HUMAN RIGHTS INSTITUTE awards an international human rights Prize called the " LUDOVIC-TRARIEUX International Human Rights Prize" in memory of the French lawyer, Ludovic Trarieux, who in 1898, in the midst of the Dreyfus Affair in France, founded the "French League for the Defence of Human Rights and the Citizen" which laid the groundwork for all leagues set up in the world and on the same model since then. The first " LUDOVIC TRARIEUX PRIZE " was awarded by a panel of renowned human rights activists on March 29th, 1985 to Nelson MANDELA, then in jail. It was officially handed over to his daughter, Zenani DHLAMINI - MANDELA, on April 27th, 1985. To award the Prize every two years in partnership with the European Bar Human Rights Institute (IDHAE), the HRIBB consults non-governmental organisations, Bars or associations with humanitarian goals all around the world to choose the candidate(s) who may fulfil the specific criteria requiyellow for nomination for the Prize. The Prize is a medallion effigy of LUDOVIC-TRARIEUX, a diploma awarded by the jury and a non-disclosed sum of money. Since 2003, the Prize is awarded every year in partnership by the Human Rights Institute of The Bar of Bordeaux, the Human Rights Institute of the Bar of Paris, the Human Rights Institute of The Bar of Brussels, l'Unione forense per la tutela dei diritti dell'uomo (Roma), Rechtsanwaltskammer Berlin, the Bar of Luxemburg, the Bar of Geneva, the Bar of Amsterdam as well as the Union Internationale des Avocats (UIA), and the European Bar Human Rights Institute (IDHAE) whose members are the biggest european law societies fighting for human rights. It is presented every year in a city that is home to one of the member Institutes. 2018 : Nasrin SOTOUDEH (Iran) (Presentation postponed due to prizewinner emprisonment). According to the Prize’s regulations, the award is given to a lawyer, regardless of nationality or Bar, who, by his work, will have illustrated his activity or his suffering, the defence of human rights, of defence rights, the supremacy of law, the struggle against racism and intolerance in any form. Also as in the past, in order to help the jury that will be established, we invite all the institutions, associations or personalities that applied in recent years, to communicate to the jury the details of lawyers likely to correspond to such criteria. According to Article 3 of Regulations", the Prize is awarded to a physical person (3-1°). In exceptional cases, the Prize can be awarded post mortem to a lawyer who, in his dedication to the cause of human rights, paid with his life in the two years preceding the date of the award (3-2°). The Prize may not be awarded to any individual who has already been acknowledged in a similar way by an international award in the field of human rights at any time in the past three years(3-4°). .
· A detailed report of action in favour of the defence of human rights, while insisting if necessary on their professional character, and/or the violations or attacks the candidate may have undergone at the time of this activity. It must be specified, that the Prize is only regarded as definitively awarded if the recipient or a member of his family accepts it and attends an award ceremony to be held during fall 2019. May we convey in advance our deepest gratitude for all applications submitted for this occasion.